We often make journeys between Sheffield and Cambridge to visit Kevin's mum. 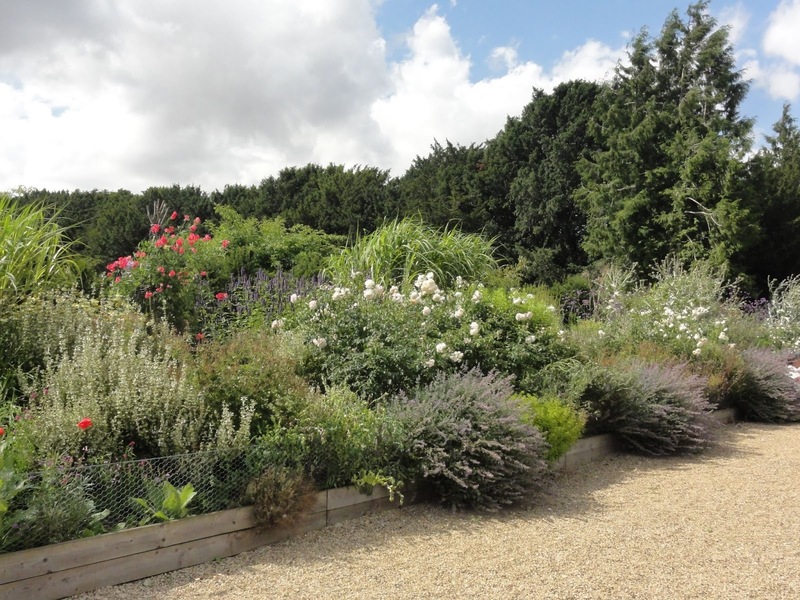 It just so happens that along this route, the A1, sits Easton Walled Garden. We had visited in late Spring 2013, so this was our second visit to the garden. The garden is in Lincolnshire, and the site was originally covered in trees. In just 13 years the garden has grown to the space that is loved by many, including Kevin and I, today. 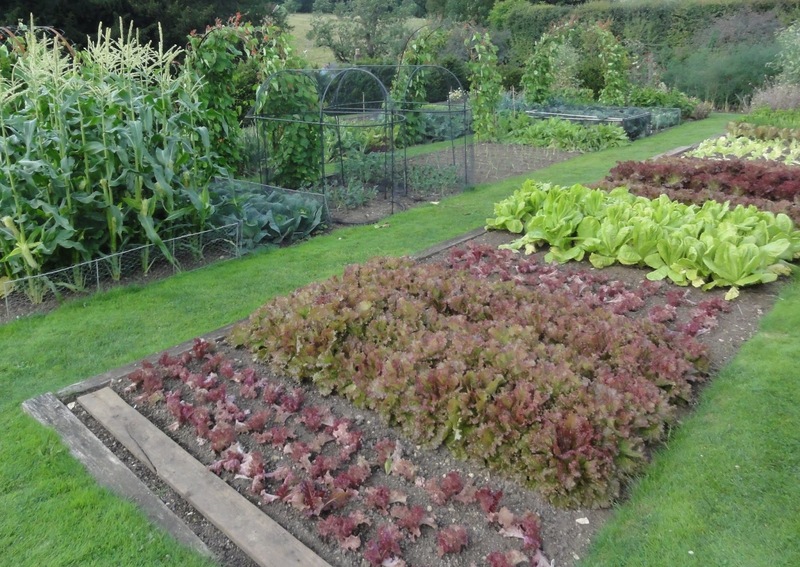 Some areas are more intimate, such as the Pickery (cut flower garden) and Vegetable garden. 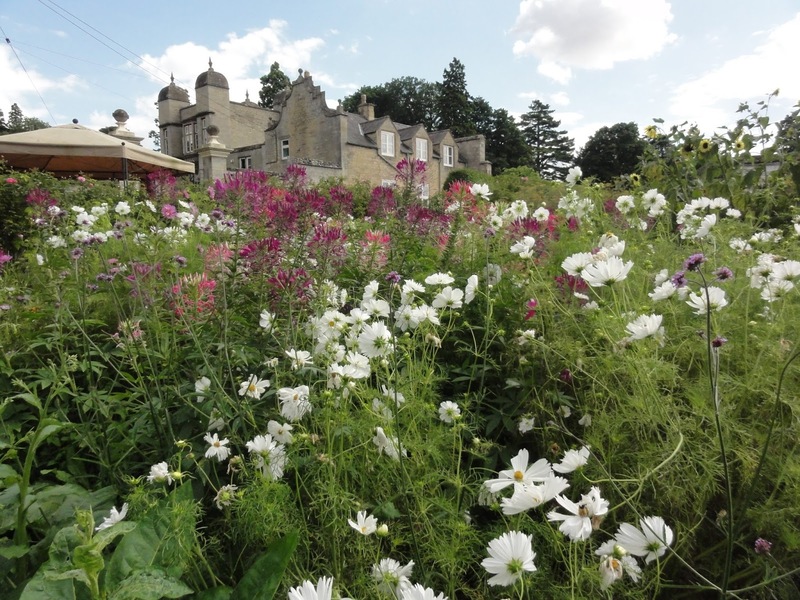 Alternatively, the Main gardens give a gracious sweep that includes meadows, the Long Border and the Orchard, mixing formal and informal, and situating the garden within context of the house, and the countryside in which the house and garden sits. The Pickery, with a large selection of cut flowers. All flowers in the Pickery are grown from seed each year. In the Pickery, out of the corner of our eyes we thought we saw something flash past us into the hole in a door. 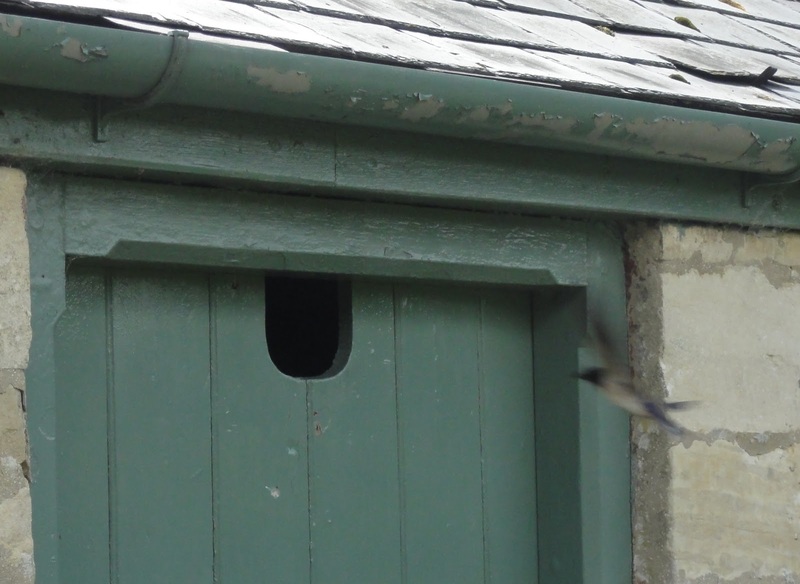 It took a while to work out what bird it was as they were very fast, but finally we saw it was a swallow. Blurry photograph, as they are so quick! I thought this staging was very pretty. It reminded me of Helen over at Patient Gardener, who has a staging that changes with the seasons. This is an idea I plan to copy in my own garden at some point in the future. The Vegetable garden food is harvested and used in the cafe. The cafe has lovely food and you can eat your lunch or afternoon tea whilst looking over the Pickery. 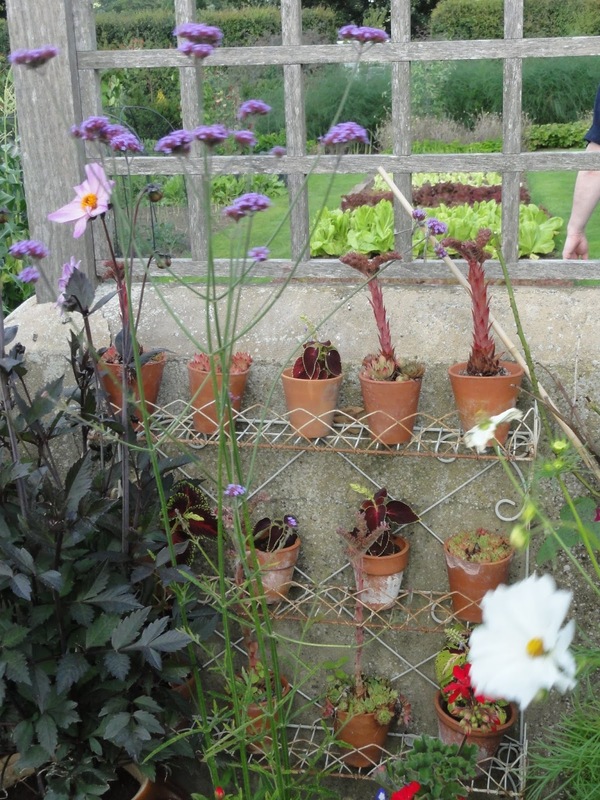 I loved these brassica cages, different sizes for different brassicas. Although short now, those Brussels Sprout or Purple Sprouting Broccoli plants will increase in size considerably over the coming months and will be protected from wood pigeons and the like. 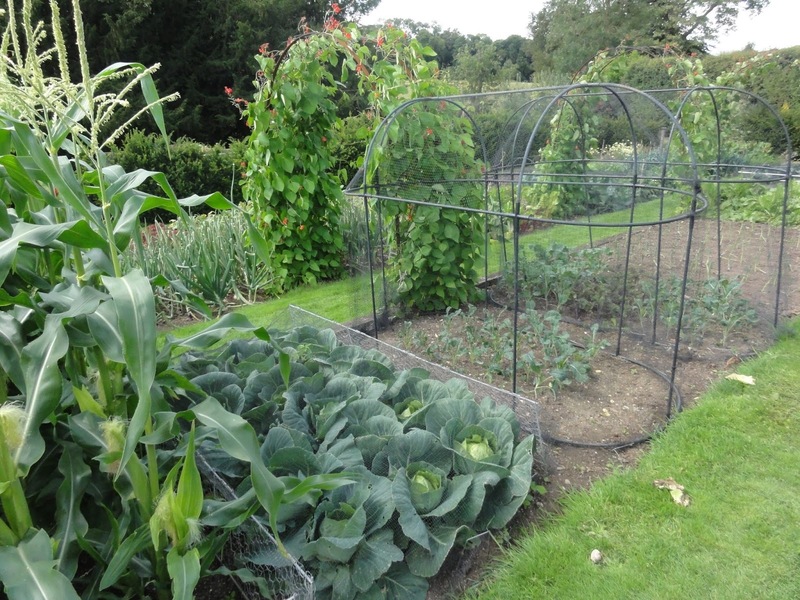 It made me realise I really should separate out my own brassica growing into cages/coverings that suit the type of brassica growing. Of course, my garden is considerably smaller, so not as easy. 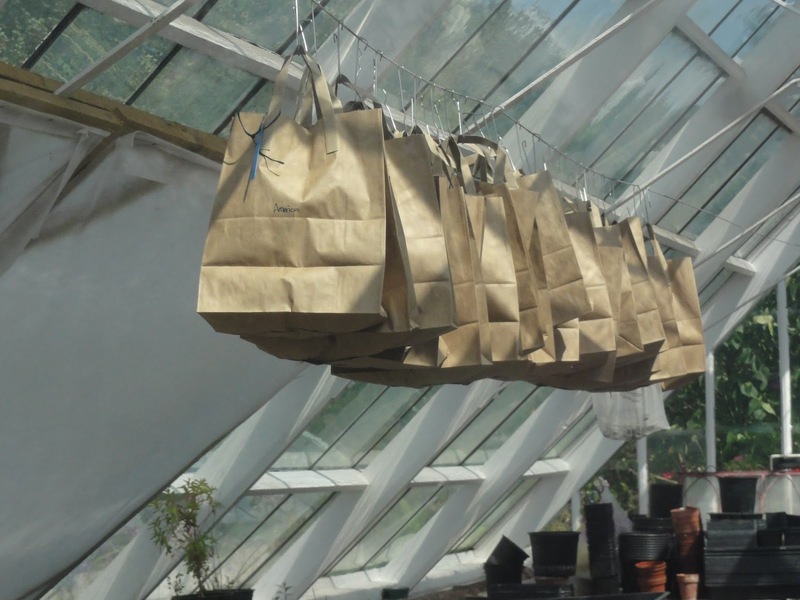 In one of the greenhouses I spied these brown paper bags hanging from the ceiling. 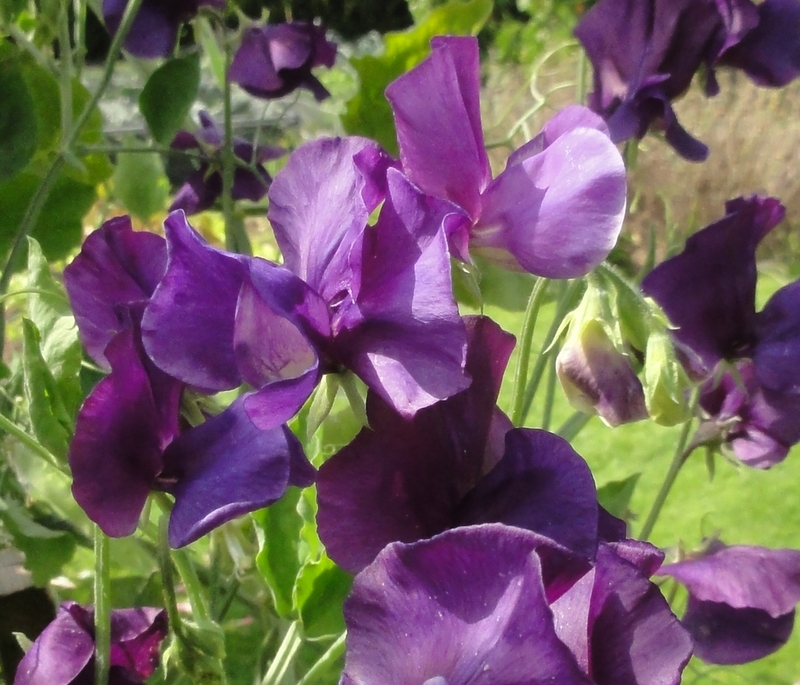 This is sweet pea seeds drying out for sowing and selling next year. 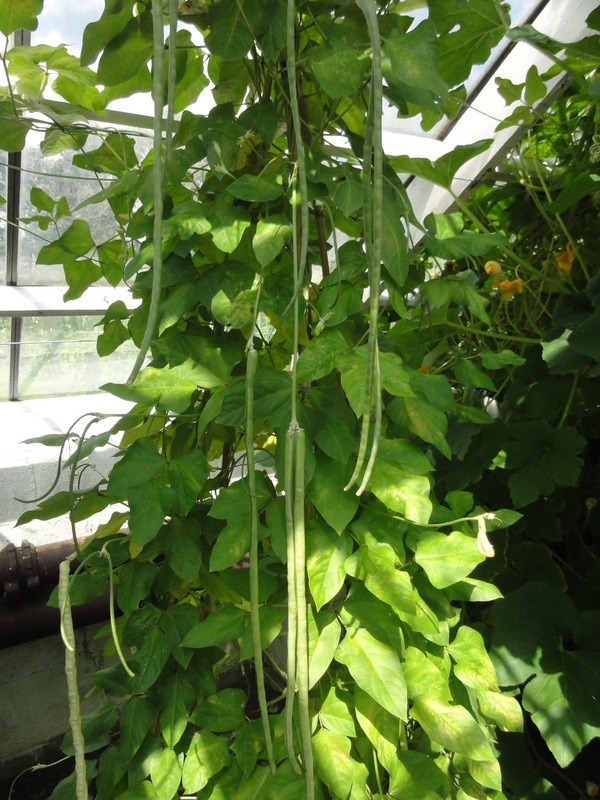 In the other greenhouse, we were both taken by these very long podded plants. It's Vigna unguiculata subsp. sesquipedalis and it's common names include: yard long bean, cow bean and snake bean. I'm curious to know how it tastes. Cow bean?! 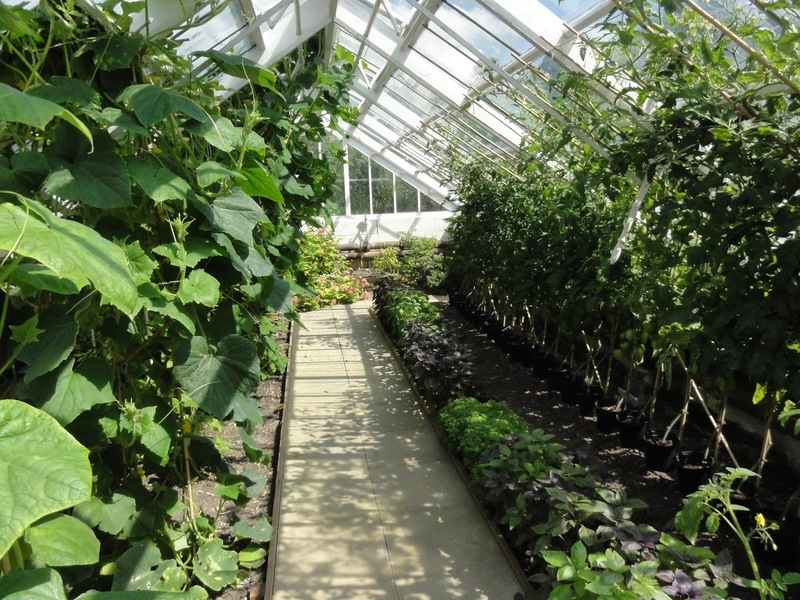 The other green house had very happy healthy cucumbers and tomatoes, both trying to get out the windows! From the Greenhouses you can get a wonderful view over to the Main Garden. The terraced meadows are just wonderful. In many ways this was our favourite part of the garden. You could hear the grasses swaying in the wind and see butterflies and bees on the wildflowers. It is so pretty, and so elegantly executed. 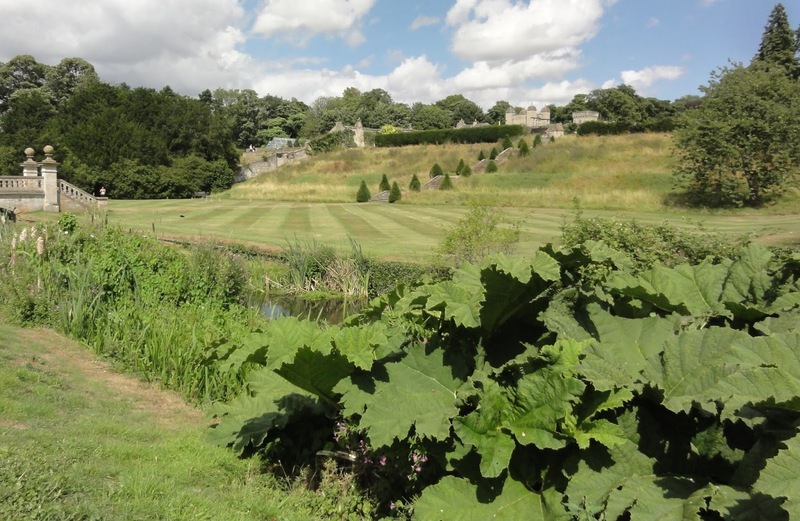 Views from and back towards the terraced meadows also reveal how well the garden is situated within the landscape. The farmed land complements the garden, and vice versa. 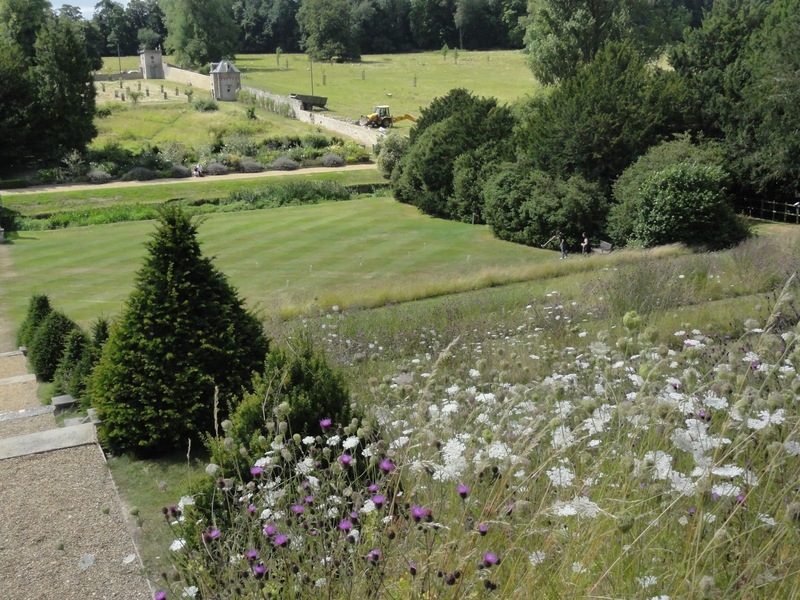 View of the meadow terraces from the Long Border. The Long Border was very peaceful. In that I mean, though there were some shouts of colour from orange daylillies and others, on the whole the colour palette was quieter, with lots of lighter purple tones and white. Very peaceful on the eye. I was particularly taken with this splash of colour in the Long Border. 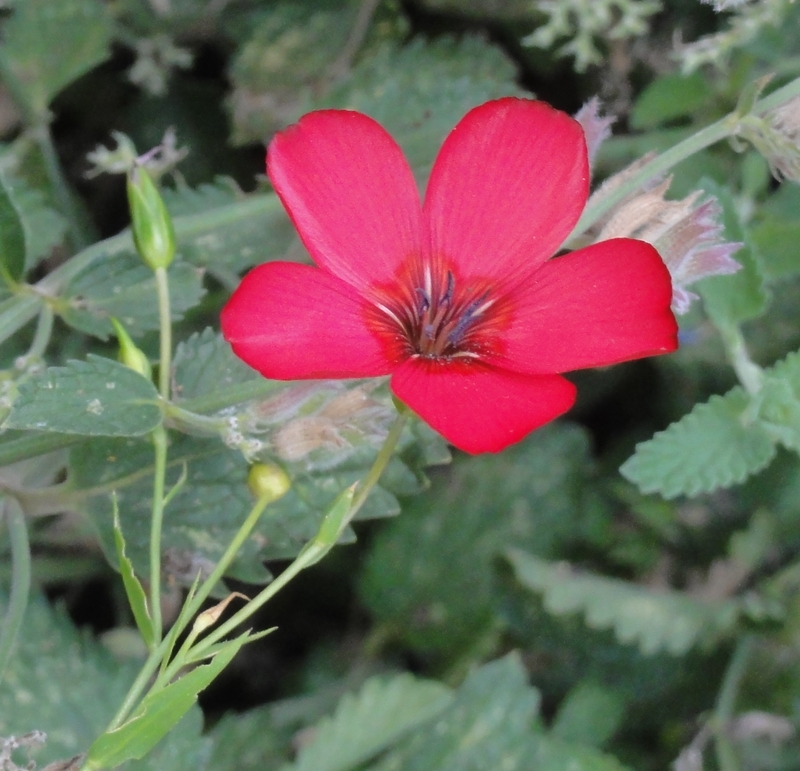 It is Linum grandiflorum 'Rubrum' - the crimson flax flower and I'll be ordering some seeds of this to grow in my garden next year. View from the other end of the Long Border. 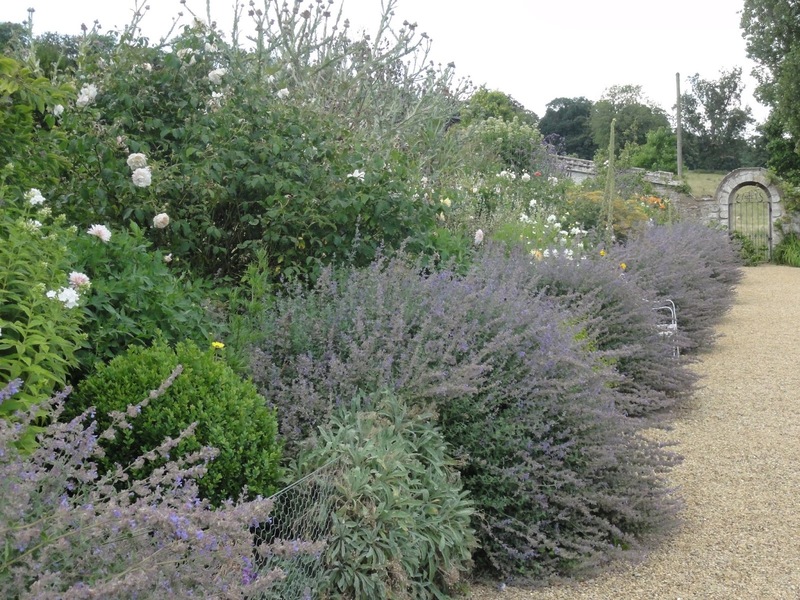 The relaxed planting style meant that plants like Nepeta (catmint), were allowed to do their thing and not be rigorously cut back as they spilled over onto the pathway. 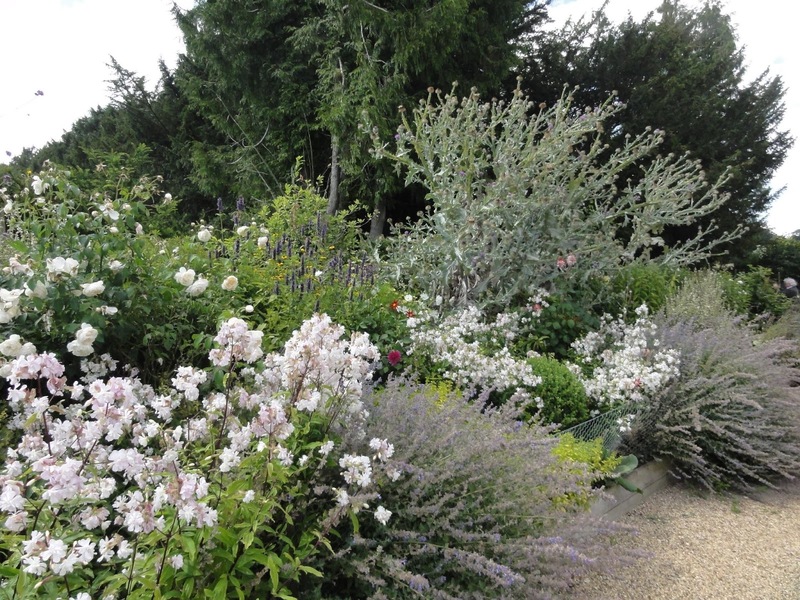 More splashed of colour in the Long Border from pink roses. And you can see the Yew walk, well, the Yews at least, behind it. We didn't explore the Orchard or Woodland as I was too tired to go further. We did manage to stop by the cafe again, for cake. Well, it was on the way back! 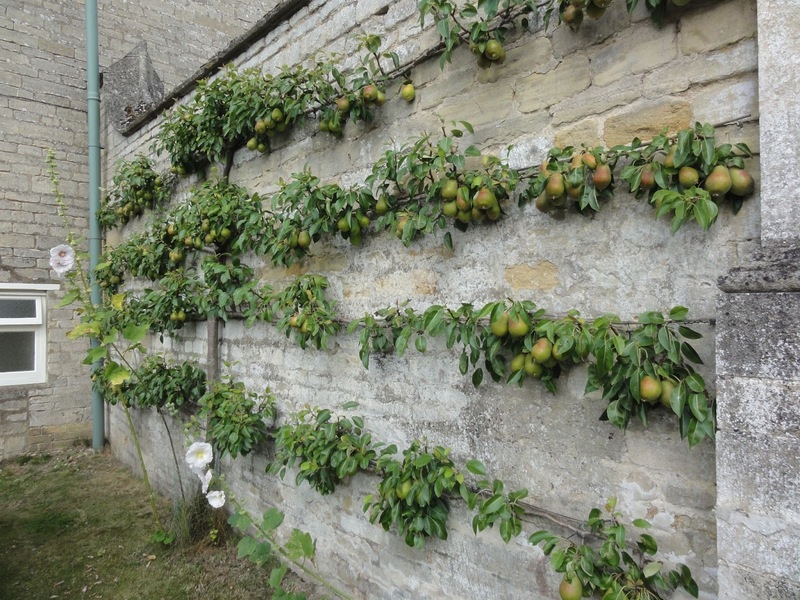 Nearby the cafe is this wonderfully espaliered pear tree. Those pears looked quite fine. I wonder if that means pear in cake in future? Yum. I loved the blend of formal and informal together at Easton Walled Garden, they do it beautifully. We will be dropping in again on one of our future trips to/from Cambridge. You did well to capture the swallow at all. Great shot! Thanks for that post! 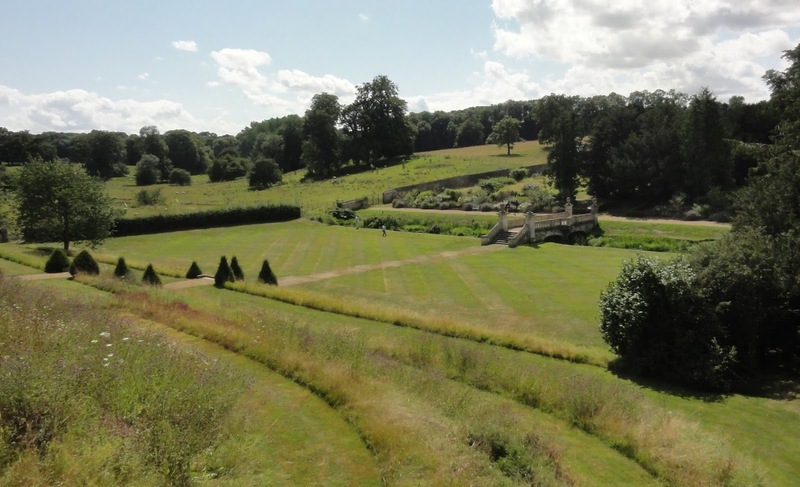 It has been on my list of gardens to visit for ages, but never quite seems to get to the top! I will make sure I go now I have seen how much there is to see.